This well-worn tokcha comprises a cloak fastener or fibula decorated with pierced borders of flattened spheres, scrollwork and a central garuda-like motif. A central hole and pin is where the fastener would have been pinned through textiles to attach an upper to a lower layer. 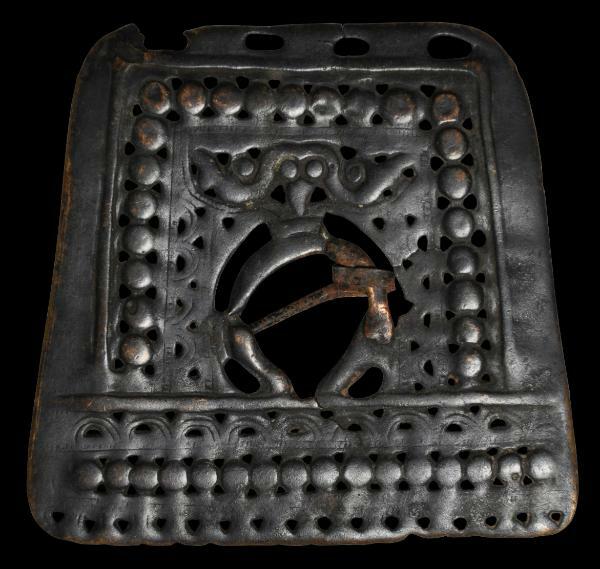 It is likely to date to around the 12th century.Tokchas (also spelt as thokcha, tokche, thogchak, thog-lcag, or thogchag) are small ‘found’ ancient, sacred objects that went on to serve as votive talismans, and which were valued for their magical properties. Usually they are of bronze or copper alloy. Many are believed to also contain some meteoric metal. Tibetans highly prized them and would wear them to protect them and to absorb evil. Usually they were hung from the neck or attached to clothing, but also were sewn onto amulet pouches or attached to religious articles. 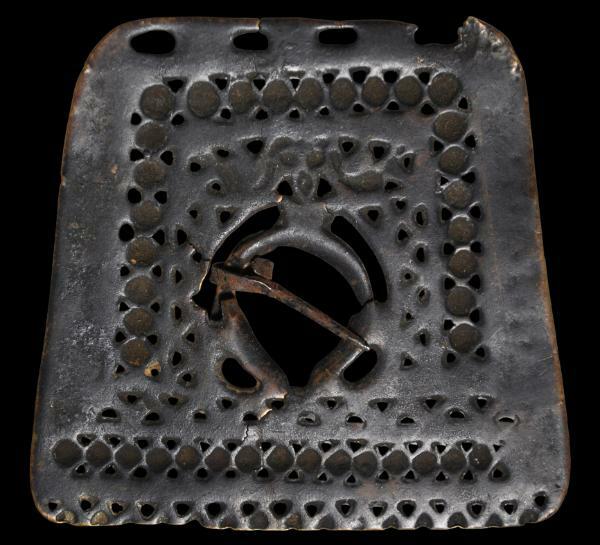 They were also used by Tibetan sharmans – healers, spirit-mediums and magicians – as part of their ‘tools’ of trade. A similar example is illustrated in Borel (1994, p. 168). The Splendour of Ethnic Jewelry: From the Colette and Jean-Pierre Ghysels Collection, Thames & Hudson, 1994.